One of the things I have struggled with the most with Essie recently is knowing what to dress her in to suit the temperature, especially at night. Both Noah and Jude were born in the autumn so it was easy to keep them warm, but keeping a baby cool in hot weather is an entirely different struggle! 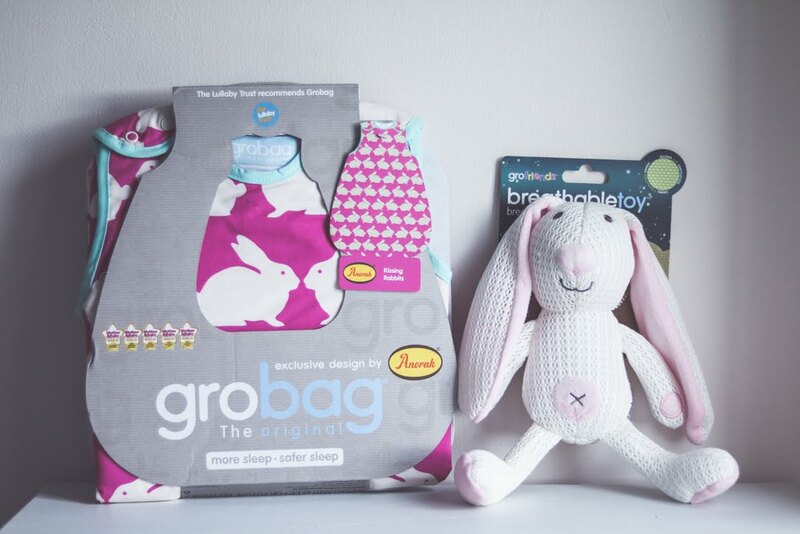 To start with, I used blankets at night time to keep Essie warm, but now the weather is much warmer we have been using a gorgeous Grobag that The Gro Company sent us to review, along with a Boppy the Bunny from the Gro Friends range of breathable baby toys. 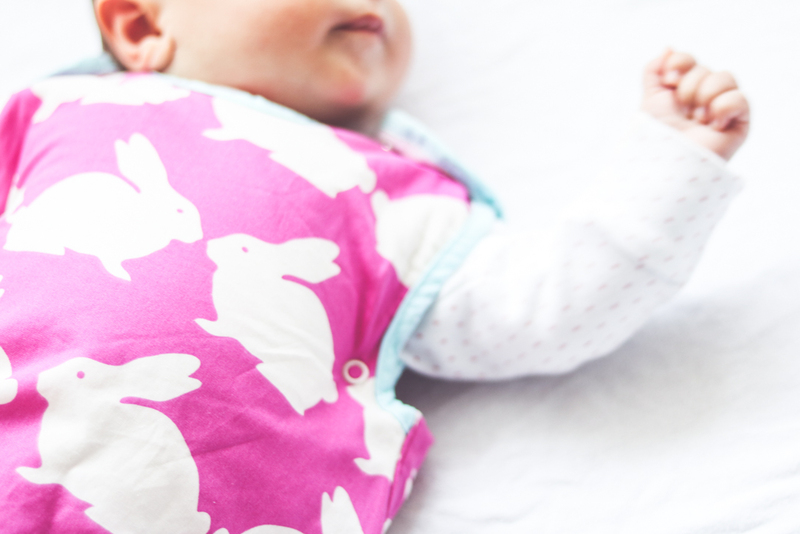 I've mentioned before that I love everything bunny related for Essie so when I spotted the Kissing Rabbits Grobag, which is an exclusive design collaboration with Anorak, I just had to choose it! I'm not the world's biggest pink fan but I actually really love the bright fuchsia pink, it looks gorgeous with touches of mint on the trim and zip. It has poppers at the shoulder, a zip running all the way down one side and the Zip-click feature at the top of the zip to hide the closure. There is also a popper under each arm hole to use when your baby is smaller, though Essie is a big girl so we've not needed to use that! The Grobag is very roomy at the bottom so Essie has plenty of space to move her legs around and keep her hips healthy and unrestricted. The Grobag is machine washable and can be tumble dried. I don't have a tumble dryer, but I have washed it and was pleased that the colours haven't lost any of their vibrancy. Using a Grobag takes the worry out of knowing what to dress Essie in at night time. Her Grobag is size 0-6 months and in the 1.0 tog warmth rating, which is made with 100% cotton jersey throughout (the 2.5 tog version has a polyester filling). All Grobags come with a handy card nursery thermometer: on one side it shows the current temperature and the other side has a guide showing whether to dress Essie in pyjamas, a bodysuit or both. I find it so helpful and refer to it all the time, especially during the heatwave when my "due in" forum friends and I have been discussing what to dress our babies in. Gro Friends are The Gro Company's range of breathable toys, they are made with a special soft knitted mesh which allows ventilation through the fabric so that it is breathable. 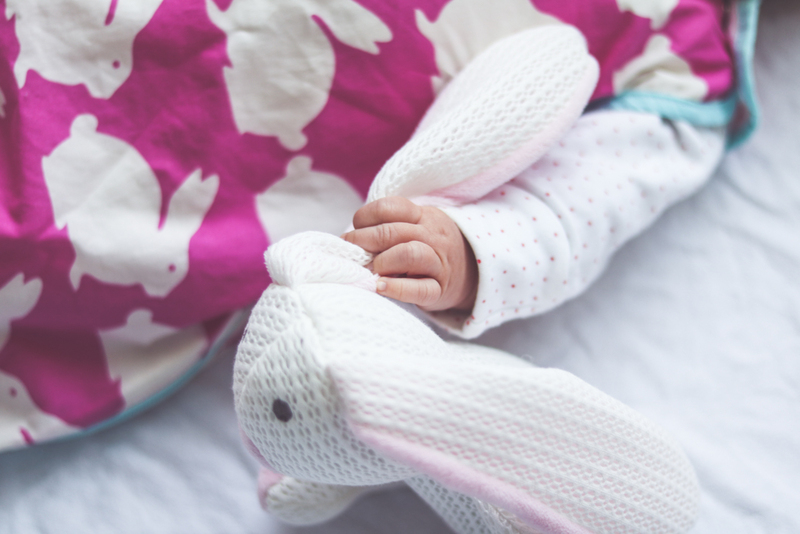 The toys are hypoallergenic, allergy friendly and are suitable from birth, so Essie's cute little Boppy Bunny is perfect for her to snuggle and practise holding. Of course, she never has it while she actually sleeps - I keep her crib empty when she is asleep. The toys can also be washed in the machine, so if it gets a little grubby it can be easily washed. So many soft toys say "wipe clean only" which is never practical with babies and toddlers! Essie's Grobag costs £35.99 and you can find it here. I might get her the Rolling Hills design when she outgrows this one, it's so gorgeous and bright! Her Gro Friend toy costs £11.99 and you can find it here. What is your favourite Grobag design? With thanks to The Gro Company sending us the Grobag and toy to review.